We are happy to welcome Anthony(Tony) DellaRocca. Tony has put together two excellent websites. One site is devoted to the 127th New York, the other is devoted to the 84th New York (14th Brooklyn). Take a moment to stop by Tony’s sites. Thank you Tony for your contribution to ECW. Tony portraying Private Charles Bartow. So much of Civil War history seems to concentrate on the Battles, not on the men that fought them. We tend to forget that unique individuals made up these regiments. They had a myriad of reasons for fighting. Rallying to their cause, social and peer pressure, wanting to get into the fight, etc. For whatever reason they decided to go off to war, and to war they went. Something I venture to say none of them were truly prepared for. They left to strains of patriotic tunes, girlfriends and wives sending them off, some with tears in their eyes because they knew that there was a chance they would never see their men again. And if those men truly thought about it, they would know they might not return. But that contemplation was for a later time. Right now all they knew was they were off to fight for the Union, to save the country, and they would be back to see their wives, mothers and girlfriends when their enlistments were up, or sooner when they got into the fight and whipped the Rebs! On September 10, 1862 the 127th New York, nicknamed the “Monitors”, left Camp Washington in Staten Island and made their way south to Washington to begin their term of service. Although they took the Union naval ship USS Monitor as a symbol of the regiment, they were named the Monitors because they were recruited as men with high moral and Christian standards, who would comport themselves as such, monitoring each other’s behavior, so they would always keep those high standards. Two such men were Henry A.C. Anderson, Company C, and Charles Chichester, Company E. Both enlisted in August 1862, Henry at New York City, and Charles at Huntington on Long Island. Both mustered in on September 8, 1862. And thankfully both survived the war. Henry and Charles started on much different paths in life. Henry, an immigrant from Germany, came to America to start a new life. Charles on the other hand was a member of one of the founding families of Long Island. Though their lives started in much different places, their paths would cross, and though they went back to their much different lives after the war they would forever share a common bond that would last the rest of their lives. Henry was born in Hamburg Germany, August 2, 1841. Both his parents having died when he was just a child, Henry was sent to the United States to live with relatives when he was 15 years old. He found employment as an office boy with a railroad company, and a few years later entered Bellevue University to study medicine. That endeavor was cut short however when Henry decided to enlist in the 127th New York Infantry. After serving only three months, the Regimental Surgeon had him detailed as his secretary. When the regiment was stationed at Folly Island, SC, the chief medical officer of the Eleventh Corps was so impressed with Henry he convinced him to take the position of Hospital Steward. He was then assigned to duty at the military hospital at Beaufort, SC. After the war, Henry came home and returned to college and earned his medical degree. He went on to bigger and better things. He built a large practice in Yorkville section of New York City. Henry was a patriotic German American, proudly belong to the Veteran Legion of The Civil War, and the 127th Veterans Association. He served six years as United Sates Pension Examiner under Presidents Grover Cleveland and William McKinley. He also took up the cause of German Americans, founding the United German Societies of the city of New York, as well as belonging to many other German American clubs and societies. Henry was also something of an inventor, getting a patent for a combination battery cell in 1897. The patent is on file with the United States Patent Office. Henry was leading a full and active professional life. Marrying his wife Nannie Lungerhausen in 1874, they had four children two boys and two girls. Taking full advantage of Henry’s status and wealth, they went on many vacations, and took frequent trips. Charles Chichester was born on the 4th of July, 1844, in Huntington Long Island. Charles grew up on Long Island, and like his father and father before him became a farmer. 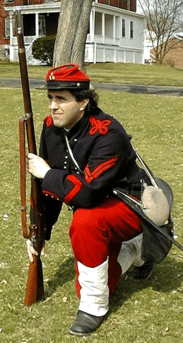 Charles was 18 years old when he enlisted in the 127th New York. He joined Company E, comprised mostly of men from the Amityville and Babylon area along the south shore of Long Island. Along with his older brother Andrew, Charles had many other friends and neighbors he knew in the Company. Charles came through his enlistment unscathed. That can’t be said for many of the members of Company E, including his brother who was severely wounded at the Battle of Honey Hill, SC. After the war Charles came back to Amityville, Long Island, and returned to farming. He married Sarah Jane Ketcham, who like Charles was born and raised on Long Island, and came from a founding family of Amityville. They had six children, five boys and one girl all of them setting down roots on Long Island. Charles too was active in Veteran’s affairs, being elected Senior Vice Commander of Knickerbocker Post # 643 GAR, Amityville, as well as belonging to the 127thVeterans Association. 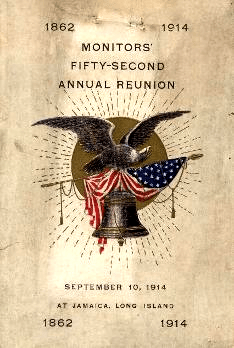 Invitation to 127th New York reunion, 1914. Both Charles and Henry had full and productive lives. Henry keeping his busy private medical practice going, working hard on behalf of veterans, and furthering the cause of German Americans. Charles becoming a bayman, working the Great South Bay as a fisherman, clammer, and also an expert hunting guide. They both attended the Monitor reunions, and kept in touch through those reunions, and their GAR activities. While both lead completely different lives, they were forever bound together as brothers through their shared experience in the 127th. Charles passed away from heart disease in 1902, at his home in Copiague, New York, not far from where he was born. In 1909, Henry was playing pinochle, as had done for years, at Aschenbroedel Hall, in Yorkville, Manhattan, when he died suddenly of a heart attack. They both were worlds apart as they began their lives, and immigrant and a blue blood. Their lives ended in a similar way, not as strangers worlds apart, but as brothers and comrades, two Monitors of the 127th New York. This entry was posted in Common Soldier, Memory, Personalities and tagged 127th New York, 14th Brooklyn, 84th New York, GAR. Bookmark the permalink.